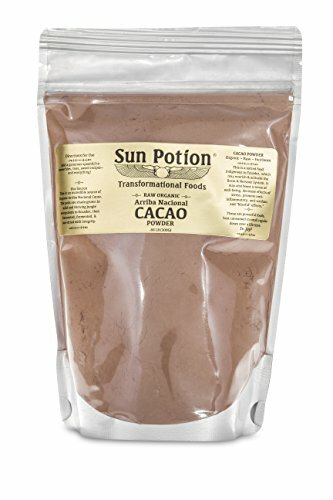 Sun Potion Cacao Powder is a natural, nutritional product, not a miracle drug or vitamin. Sun Potion products like Cacao Powder are not intended to treat, diagnose, cure or prevent any disease. CACAO POWDER RAW AND ORGANIC Sun Potion Cacao Powder is a vegan, non-alkalized, and non-GMO dietary supplement and superfood. ACTIVATE THE BRAIN AND NERVOUS SYSTEM Boost a sense of well-being, decrease the effects of stress, and promote anti-inflammatory and blissful effects. INCREDIBLE SOURCE OF ARRIBA NACIONAL CACAO The pods are shade grown in wild and thriving jungle ecosystems in Ecuador, then hand-harvested, fermented, and sun-dried with integrity. HAND SELECTED CACAO BEANS FROM ECUADOR One of the richest sources of antioxidants in nature. Add to any bake mix, blend in a smoothie, stir into beverages! 100% SATISFACTION GUARANTEE Sun Potion products are made in the USA by strict GMP guidelines in an FDA approved facility. We are 100% confident and stand behind the quality. We believe the added health benefits of the product will make you feel as great as it does us or your money back! If you have any questions about this product by Sun Potion, contact us by completing and submitting the form below. If you are looking for a specif part number, please include it with your message.